Iconographic productions, these DVDs are shot directly from the original art and are word-for-word narrations of the book text. Public performance rights included. A dramatic retelling of the historic flight across the English Channel by aviation pioneer Louis Bleriot, a flight made possible by his persistent efforts and his family's loving support. 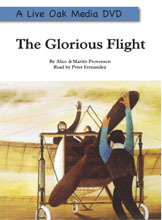 A dramatic retelling of the historic flight across the English Channel by aviation pioneer Louis Bleriot, a flight made possible by his persistent efforts and his family's loving support.